Light and stretchy, our fully-lined spring coat in navy is a modern classic. Collarless, and with turn-up cuffs and a feature button, this A-line coat can be easily worn with layers on cooler days. Pair with a kay me dress and Select scarf for instant elegance. 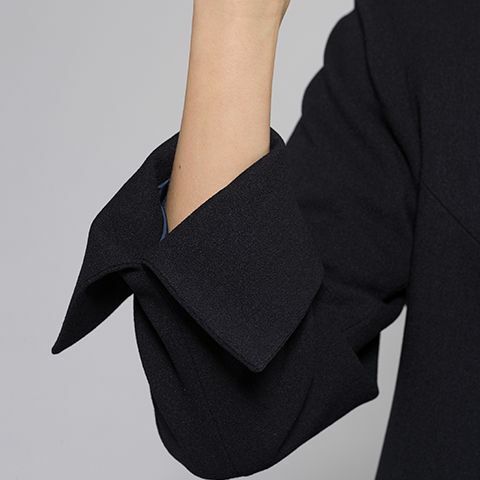 Double-woven stretchy fabrics mean that not only is our spring coat fresh and light, it's also fully machine washable with a beautiful drape. The perfect partner for kay me dresses and skirts, this classic chic design can be dressed up or down. Hidden snap closures keep lines sleek, with cuffs that can be styled your way.